I missed carpool because I worked a little late, so I had to ride the BART, then take a city link bus to get to Vallejo. I got home around 8:45pm and was so tired. Once I walked in the house, I saw a package from Rosy Dawn Gardens. YEAY!!! … My Coleus…. I took photos, but they are still in my camera. I’ll post them later today. Before I post them, I wanted to show photos of the shelves I added in my bedroom to grow seedlings and overwinter cuttings. This photo was taken about a month ago. 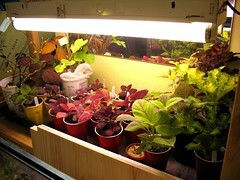 Below is a new photo of the bottom shelf that mostly houses my Coleus. Some are grown from seeds that I collected last year and some are overwintered cuttings. Click on the photo to see some notes I added on with flickr. 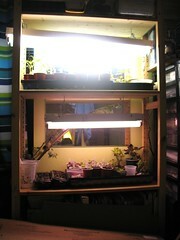 This entry was posted in Uncategorized and tagged coleus, cuttings, growlights, seedling. Bookmark the permalink.